Gum disease in dogs is the most common issue when it comes to dog dental care. It can be extremely painful for your dog so preventative measures should always be taken. Although it’s not always easy to spot gum disease in dogs, it’s essential to check your dog’s teeth regularly and know the signs and symptoms to look out for. Gum disease begins when bacteria stick to the surface of your dog’s teeth, forming an off-white sticky layer called dental plaque. The build-up of plaque can quickly escalate into gingivitis. If the plaque isn’t removed, it hardens to form tartar (a brown, rough deposit on the teeth) within a few days. 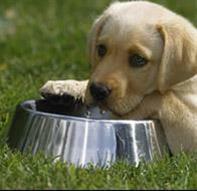 Plaque damages the gum tissues causing gum disease in dogs to worsen. Other structures, such as ligaments and bones, which attach the teeth to the gums become damaged, leading to periodontal disease. This is a painful disease and if left untreated, the tooth will become loose and eventually ‘fall out’. 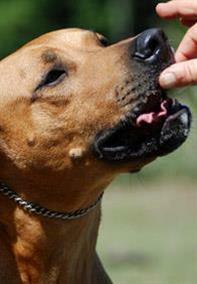 Bleeding gums - if you notice your dog’s gums bleeding when he chews or your dog has red gums around the teeth. Behaviour – another sign of gum disease can be a change in your dog’s behaviour, particularly if you notice that they are less lively or less willing to play and are becoming reluctant to have their face or head touched. However, after dog dental treatment, your dog is likely to feel so much better that his behaviour returns to normal. Providing an oral care regime, looking in their mouth regularly and having your pet’s mouth checked regularly by your vet or vet nurse can help to prevent gum disease in dogs.